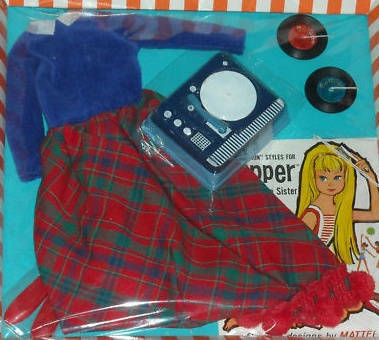 Skipper Vintage Doll Clothes 1964 - Skipper doll was introduced to the Barbie family in 1964, as Barbie's little sister, she stands at 9 1/4" tall, has non-bending legs, her wardrobe consisted of ten fashion outfits, one gift set, some outfit's coordinated with Barbie's. For larger photos, full descriptions, click here. Skipper Vintage Doll Clothes 1965 - Skipper got two new friends this year, both have her same body and size; girlfriend Skooter & Ricky her male friend, Skipper & Skooter got thirteen new outfits for 1965, all ten outfits from 1964 were repeated, plus six new Pak items, three gift sets. For larger photos and full descriptions, click here. Skipper Vintage Doll Clothes 1966 - Twelve new outfits. For larger photos and full descriptions, click here. Skipper Vintage Doll Clothes 1967 - Twelve new outfits. For larger photos, full descriptions, click here. Skipper Vintage Doll Clothes 1968 - Eight new outfits plus; one Sears exclusive, one Sears gift set. For larger photos and full descriptions, click here. 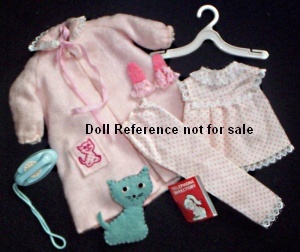 Skipper Vintage Doll Clothes 1969 - Twelve new outfits and one Sears gift set. For larger photos and full descriptions, click here. Skipper Vintage Doll Clothes 1970 - Twelve new outfits, six Pak items, one Sears exclusive, one Sears gift set.